Israel has shut down a Palestinian pirate radio station in the West Bank that had been disrupting communications at Ben Gurion International Airport. The broadcasts led to several flights being cancelled and many others being delayed over the past two days. Communications Minister Ariel Attias said he was taking steps to eradicate the phenomenon of the pirate stations. 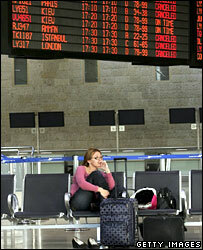 Staff at the airport near Tel Aviv had threatened to strike on Thursday if the radio interference continued. A spokesman for the Israeli Airports Authority, Uri Orlev, said his colleagues had instead decided to stop working whenever there were further disruptions. Mr Orlev said the interference represented a "clear danger", with pilots reportedly hearing music on their radios instead of instructions from the control tower. "These disruptions do not allow us to run the airport as we should," he told Israeli Channel 2 TV on Wednesday evening. The disruption continued on Thursday, with the airport control tower forced to allow 10 minutes between each take-off as a safety precaution. After announcing it had closed down the pirate radio station in question, the Israeli ministry of communications said it was taking steps to eradicate illegal broadcasts altogether. The ministry said it had already shut down 50 pirate stations since the beginning of the year. Transport Minister Shual Mofaz said he would call for an urgent cabinet meeting on Sunday to discuss pirate radio transmissions and demand that criminal proceedings be brought against the perpetrators.